Catholic rap against "the culture of death"
The thermometer marked 22 degrees and the sun was plummeting on Serrano when the head of the demonstration reached the apex of the Plaza de la Libertad. Thousands of families came domingueándose, slowly, between a sea of ​​green balloons, the last symbol of a Catholic pride already put on guard pre-election. Lined up from the stage, the whole street burst into a loud cry - "Yes to life!" - against abortion, against euthanasia and against, even, advances in medicine that go beyond the "natural procreation". According to the organizers, 40,000 people attended the march, twice as many as last year. For its part, the Government delegation in Madrid calculates about 6,000 attendees. "Yes to life!" 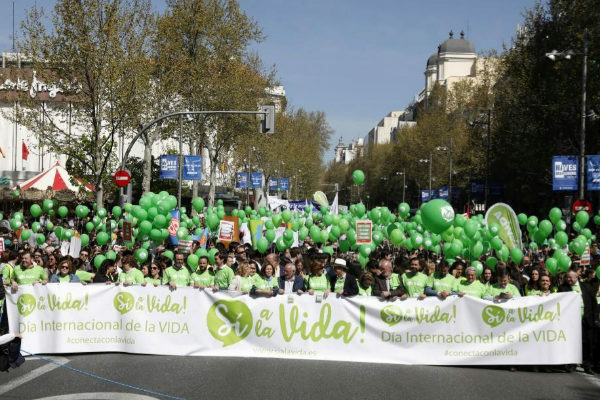 It is the motto of the demonstration organized today in Madrid by Catholic associations to eradicate what they call "the culture of death". They have joined the Popular Party, Vox and the 'lobby' ultra Hazte Oír. What does the organizing platform demand? The total prohibition of abortion. "We proclaim that all life is valuable, unique and unrepeatable," began the manifesto that abrochaba the act. "We want to unravel the death plot" and "we support advanced medicine" that supports "natural procreation," the document said. "We reject the techniques that destroy, manipulate and trade with human life at any stage of its existence," he argued. At the beginning of the event, the general secretary of the PP, Teodoro García Egea, who has captained the 'popular' delegation, defended the position of his party: "We are in favor of life, motherhood, conciliation and the future of families , and it is not understood that parties like Podemos or PSOE are not in this demonstration ". "Abortion is not a right, it is a drama," he said. But the truth is that the organizers of this small green tide are too short the position of the PP, although Pablo Casado has raised, in a personal way, the possibility of returning to the law of assumptions of 1985. "Since 1985, with the law of abortion, two million children have not been able to see the light ", denounced the presenters of the act, before requesting" a minute of silence for all those children ". Cañas por España, Vox's youth initiative, if you buy the complete anti-abortion pack: "Killing innocent and defenseless human beings is atrocious and a serious threat to our survival. " Aborto cero! ". Another of the highlights of the concentration has been the interpretation of a rap theme against suicide: "Do not do it please, there is still much to lose the value." Or: "I am not God to judge you, live, love." That alibi of modernity inflamed the front ranks, spurred by an infrequent sense of belonging. "Yes to life!" Shouted a group of teenagers without stop while some took off their feathered vests and others rolled up their shirts. So perpendicular the heat descended. The organizers then underlined the testimony of two teenage parents who helped their families to get ahead after a pregnancy at age 19. And they passed the microphone to their daughter Paula, who shouted that her name is Paula for jubilation from 'providers'. Lack of a claim, "so important with what comes to us in a few days." It was this: "We ask politicians to make life an urgent matter and legislate without fissures or exceptions" against any abortion . It served as a solemn oath that the "pro-life" electorate refuses to squander its votes on utilitarian strategies. The message was already launched. To the sound of 'A contracorriente', from El canto del loco, the families began their other pilgrimage, in search of the natural refuge of the terraces of Madrid. Serrano had already become the Mad Cool of the Catholic right. In the Mallorca of the corner of Columela there was not a pin. So the 'speaker' asked for more music, "which is now animated". "And buy, please, 'merchandising_ to be able to pay for the stage, bracelets, shirts ...". The 'cayetan' outfielder in the first rows came down, definitely, when 'Kisses in War' sounded, one of Morat's hits. So high was the young atmosphere that the 'speaker' was emboldened to close the act: "And now we are all to collect all this! Come on, chavaleeeees!". On the side, while they were retreating, two teenage girls drew their own conclusions: "Let's see, even if it's illegal, if you want to have an abortion, you're going to have an abortion." "If you have pasta," the other interrupted.